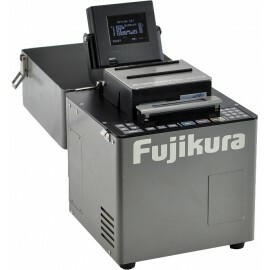 Fujikura FSM20CSII fusion splicer utilizes a PAS (Profile Alignment System) that aligns the core of single-mode and the cladding of multimode fibers. A built in monitor allows cross-sectional viewing of the prepared fiber ends, and displays cleave angle and estimated splice loss. the system will splice both single-mode and multi-mode fibers. Alignment, fusion and splice loss estimation are automatically completed by the built-in computer. The FSM-20CSII Arc Fusion Splicer is used for splicing SM (Single Mode) optical fiber and MM (Multi Mode) optical fiber. Mutual aligning of both SM and MM optical fibers is performed automatically by the image processing microcomputer built into the splicer. The power source applicable for this system is AC85-265V (50160Hz) or DCIO- 15V. The AC voltage selection is automatic. It can be preset for 20 different splicing modes (10 settings for SM fibers and 10 settings for MM fibers). This allows various fiber types to be spliced. Each mode consists of 6 parameters (ARC POWER, ARC TIME, FORWARD, PREFUSE, GAP, ECF). See Section 2.1.2. For SMl-SM10, core axis alignment and splice loss estimation are performed automatically. For MMl-MMlO, fiber cladding alignment and splice loss estimation are performed automatically.